Enjoy a mini vacation at home after a few updates to your outdoor lighting. Is there a difference between a ceiling fan/light for use inside as opposed to outside? To get answers to all your home lighting questions, contact an ALA-member showroom. For a limited time the ALA is offering Bright Ideas subscribers a complimentary copy of the 120-page magazine. Presented by ALA and Better Homes & Gardens, the annual publication is a great resource for lighting designs and decorating ideas for every room in your home. Visit an ALA-member showroom for professional lighting advice and to pick up a copy of Lighting magazine. No lawn is too small. Even modest homes or those with limited yards or gardens can benefit. 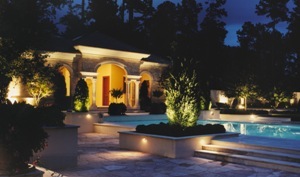 Low-voltage outdoor lighting is inexpensive, safe and relatively easy to install. A handy homeowner can put in a low-voltage lighting system over a weekend. All you need are basic tools, a transformer (to reduce standard 120-volt household current to the safe 12-volt level), outdoor low-voltage copper cable and low-voltage light fixtures. It is not necessary to do everything at once. For your initial project, install a transformer that is larger than required, because it will only consume the amount of electricity being used. The larger capacity transformer will already be in place when you install additional fixtures. Buy well-constructed fixtures. They will last decades longer than cheap fixtures. Find high-quality fixtures at your local ALA-member showroom. Remember that a little light goes a long way outdoors. For example, a 50- to 60-foot pathway can be adequately illuminated with three to four high-quality lights. Save electricity by using a timer or photo cell. A photocell automatically turns the lights off and on when it becomes light or dark outside.